Raise and properly support the vehicle. Refer to Lifting and Jacking the Vehicle. Remove the front fascia. Refer to Front Bumper Fascia Replacement. Disconnect the charge air cooler inlet duct from the charge air cooler. 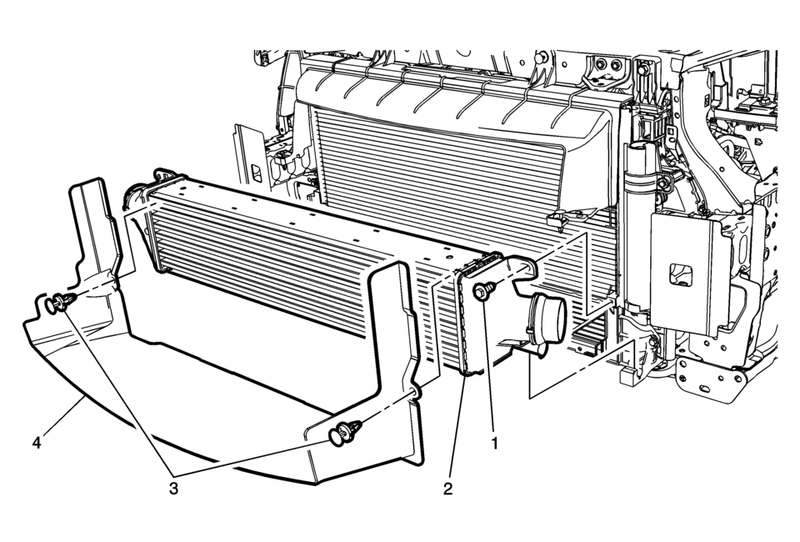 Refer to Charge Air Cooler Inlet Air Hose Replacement. Disconnect the charge air cooler outlet front duct from the charge air cooler. Refer to Charge Air Cooler Outlet Air Hose Replacement. Pull the charge air cooler upward to release the cooler from the rubber grommets. Remove the charge air cooler air deflector fasteners.